The Daedalus GLX is the only small high performance parachute designed specifically for ground launching and Blade running. 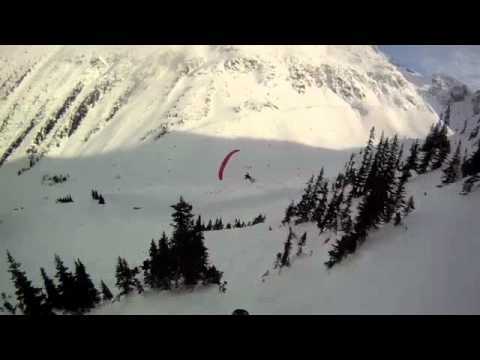 After many years of development Daedalus canopies (father of Icarus canopies) has developed a cutting edge wing that dominates the slopes. The new GLX is a ground launching machine! 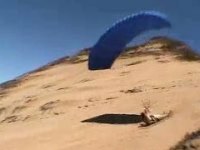 After several years of beta testing Daedalus Canopies have developed a parachute that is easy to launch and a joy to fly down the mountain. The GLX is completely cross braced with a hybrid nose section. The center three cells of the canopy are open and the cells on each side of the center are closed with opening similar to a JVX. The GLX has no stabilizers, reinforced ribs and utilizes Spinnaker cloth allowing it to hold the airfoil's shape better. Spinnaker material makes launching easier and is more rigid during flight. The GLX comes standard with two HMA or Vectran line sets. As an option, pilots can get a continuous line set allowing broken lines to be easily changed in the field without tools. A continuous line set makes loosing a line during flight less "stressful" since you have more attachment points between you and the canopy. If your serious about ground launching and want the most from your Bladerunning experience there is only one choice. 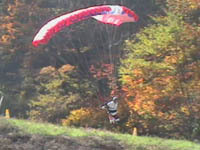 The GLX is not designed for skydiving but the early versions had design parameters that allowed it to be deployed. Also available is a THE DAEDALUS GLS - The Ground Launch Sport a less aggressive alternative to the GLX (Ground Launch Extreme). The GLS has been designed for canopy pilots who who normally fly non-cross braced canopies and enjoy ground launching. The GLS XF can be used as an everyday canopy but is best used for amateur swooping and ground launching. Submitted by oosskis on January 16, 2008 - 7:05pm. It's a great wing. Inflates quickly overhead, steers and takes off best on rear risers. Faster and considerably steeper glide than the Nano in full glide. Not as turny. Flies best with hands off the toggles and just using riser and harness inputs. Definitely not the type of wing I would use to take off, land, do a few ski turns and take off again... So far I've only straight lined it. It's meant to fly. The wing is faster and has a steeper glide than most speedflying wings, but turns less quickly. It will dive more and recover more slowly in a turn and loses a lot of altitude quickly. It works well for steep, wide-open terrain and is not as forgiving when touching down. I am looking into getting an 11m speedfly wing (Gin Fluid) to fly some not so steep terrain and to be able to do some more touch and gos. I would liken the GLX to a jetfighter and normal speedfly wings to an aerobatic plane. In retrospect, I would not buy that wing again (it's too expensive and limiting) but I got it when speedflying was in its infancy. There's three people up here in Canada who have them. I fly a 12.5m and probably weigh 110kg with gear, Greg flies a 11m and Rob flies a 12m. Greg and I probably have a couple of hundred launches each.